I love that some of the regional breweries are looking sideways, forwards and backwards in order to appeal more broadly to different drinkers. Fuller’s have got the Past Master’s series, the barrel-aged beers and delightful seasonals; Adnams have long made interesting seasonal beers and limited-run specials; Brains have built a craft brewery on the side for producing different beers, including a run of IPAs; just yesterday a bottle of Progress arrived from Black Sheep, a special 10% ABV beer to celebrate 20 years of brewing, and that sits nicely beside their excellent Imperial Stout; and Shepherd Neame have been brewing small batch beers on a handsome little pilot system for a few years now without really shouting about it, then they released Generation Ale, a wonderful 9% ABV strong ale, and now they’ve brought out an India Pale Ale and Double Stout. Being a Man of Kent, I’ve grown up with a constant presence of Shepherd Neame, with most drives through the county taking you past at least one pub with their familiar red sign, yet I’ve never really drunk much of the beer. But this year I’ve had four Sheps beers which have massively impressed me. 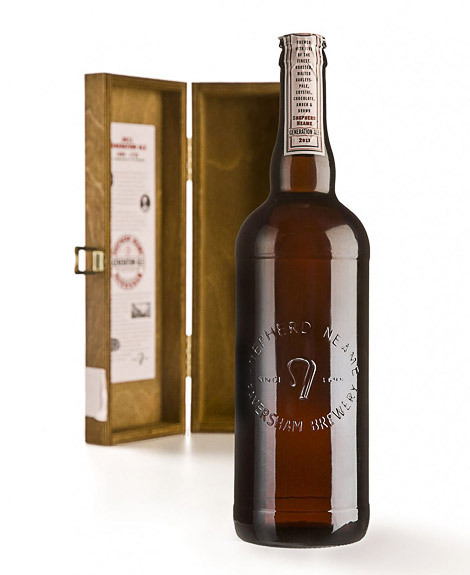 The Generation Ale is an excellent beer, aged in tank for a long time, it’s got a deep complexity of chewy malt and spicy, fragrant hops, think roasted oranges, sherried fruit and toast. There was also a green-hopped beer, 5.5% ABV, and a real ripper of fresh hop flavour, pungent and intense. And now there’s the India Pale Ale and Double Stout, historic-styled, in liquid and design, they look back to old brewing books and make the styles relevant today. The India Pale Ale (6.1% ABV) is a brutal thwack of Kent-grown Fuggles. Amber in colour, the flavour is a wild spectrum of hop from earth to berries to chocolate and wood. The bitterness is uncompromising, hitting the tongue with bracing force, balanced by caramel and vanilla in the body. It’s got that indefinable Fuggles-thing which makes it such an interesting hop, a flavour that’s almost impossible to describe but marvellously, massively English and in this beer it's really showing off. Double Stout (5.2% ABV), for me, is completely evocative of early November. You know how you can walk outside on a clear cold night, when fireworks have been exploding all around, and the air smells of treacle, smoke and leaves. This beer makes me think of that. It’s black, full of a roast bitterness, ashy smoke, liquorice and an intense almost-savoury dry, dark malt character which clings onto a bold smack of bitter hops. Both beers are excellent. There’s a fullness, complexity and depth to them and they are great side-steps from the core products. I think they look brilliant as well – as soon as I saw the design, I wanted to drink the beers. It’s great to see regional breweries stepping outside of their best bitter comfort zones and producing wider varieties of beers. One thing most of these regional breweries have over others is history. 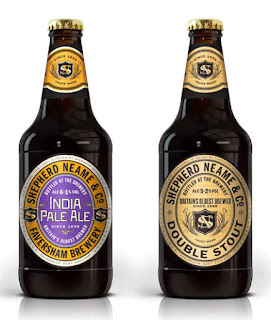 It’s good to see Shepherd Neame using it and making it relevant today. All of these images are from Oh Beautiful Beer. From this post and this one. You make me want to open mine now! I'm really impressed that SN have decided to push their beers a touch further reaching out to those who want full-flavoured beers rather than session ale pints. I'm also really glad that they are in dark brown bottles rather than the light-sensitive clear ones! Cue everyone having a moan about how the regionals are jumping on the 'craft' bandwagon so that they can make overpriced beer for hipsters and force out the real ale drinkers. Luckily these beers are neither overpriced nor for hipsters. I also don't think they're after a 'craft' market. I think they are appealing to their own drinkers with more variety. Do it! The Generation is excellent! And it looks amazing. Half of the fun is opening it! Completely on the nail, haven’t drank mine yet but Generation is superb, and I think from what I understand there are more beers from their archives to come — if it’s beer that has a soul and makes your heart, it doesn’t matter if it’s a family guy or a craft guy I’m happy. Good piece Mark. I think you are on the money with "looking back". Lees Manchester Star is another example of the genre (from the 1870's) and it came second in Sainsbury's Great British Beer Hunt, so it can bring commercial advantage too. I must look out for these two. Unfortunately unlikely though in my neck of the woods. Great - I'll look out for the Manchester Star! As for distribution, I think these are both year-round so that at least means they are out there and not just small-run one-offs (I think). We get Manchester Star over here from time to time and it always goes quickly (not all me, honest). It would be great to get some of the Shep stuff as well, and can I say that they look so much better in brown bottles than clear ones! 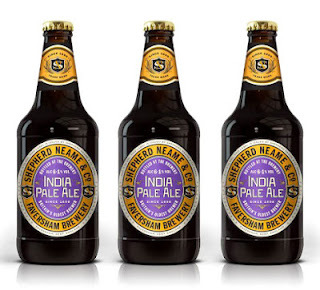 I like your article Mark, but have a problem so far as Shepherd Neame are concerned. Those who know me will be aware I am not a fan of Sheps. Their beers have a harsh,coarse bitterness about them that I find particularly unpleasant, and yet I am a fan of hoppy beers. However, I am willing to give these "retro" beers a try, particularly if they have been brewed to original recipes, using traditional aroma hop varieties, rather than high alpha acid, low aroma types. The question is, where can I buy these beers? As you know I live in Kent, but have not come across them on sale anywhere yet. Can you help please? ps. When I first started drinking, back in the early 1970's, Shepherd Neame Bitter was a wonderfully hoppy brew, with a lovely, almost floral aroma. Something went badly wrong with Sheps, and I now make a point of avoiding drinking in their pubs. Paul - I'm not certain where they are available, I'm afraid... As for hoppiness - Sheps only use British hops in their beers, focusing on the traditional varieties, and none of those are high alpha. There's a good bitterness in these two, definitely bracing and assertive, but there's some substantial body to the brews which help it out. Thanks Mark. 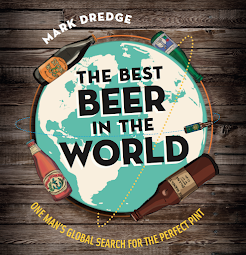 I have looked on Shep's website, and whilst the beers are available by mail-order, this is for case volumes only. Without having tasted them, I am un-willing to take a punt, especially knowing my reticence towards their beers. Also, at £17 a bottle, I will definitely be giving the Generation Ale a miss! I did see on the CAMRA Breweries Report for Kent & Sussex, that the IPA and Double Stout are for the export market only. Hopefully this information is incorrect, so I will keep looking. I am still not convinced about the hop varieties Shep's use. They used to grow all their own at their farm at Ospringe, but this was sold off some time ago. They might well be using traditional Fuggles and Goldings for these "retro" beers, but I have mu doubts about their regular brews.